Habits form very young. If your young child does not look after their teeth then this habit is likely to go through to adulthood, their permanent teeth are then at risk. The risk of other diseases. If your child does not look after their teeth and they develop excessive caries then the bacteria can travel around their body causing other health problems. The adult teeth risk being affected also. Your child adult teeth fixed immediately underneath their baby teeth, if an abscess forms around the baby teeth then the bacteria in this abscess can begin to attack their underlying adult teeth also. So, yes, it’s incredibly important to look after your children’s teeth… Here’s some more advice. Should I use toothpaste on my baby’s teeth? Yes, however always use a dedicated children’s toothpaste. The outer surface of our teeth, known as the enamel is made up primarily of minerals. Over time, teeth require remineralisation in order to keep them strong. Fluoride has been shown to help with this remineralisation process which is why it is added to toothpaste. However there is a limit on the amount of fluoride that we should use, especially when our bodies are small, for this reason toothpaste manufacturers make a children’s toothpaste with a lower dose of fluoride. Ideally you should start brushing your child’s teeth before they have any! Keeping their gums clean and free of bacteria is also really important. Regularly allowing your baby to experience the sensation of a toothbrush in their mouth also gets and used to what it feels like, making them less likely to object to teeth cleaning when their teeth finally come through. You can read more teething advice here. The general advice we always give is to use a fluoride containing toothpaste. Fluoride helps the remineralisation process of your teeth and without it you stand a higher chance of developing tooth decay. The same principle applies to children. How to care for my baby’s new teeth? Allow a baby to get used to a toothbrush before any teeth come through. When the teeth finally come through, use a grain of rice sized amount of fluoride containing children’s toothpaste. When your child reaches three years old then use a piece sized amount of fluoride containing children’s toothpaste. Supervise your child is cleaning until they are released 7 years old. Clean your children’s teeth from behind. If they are a baby then sit them on your knee facing away from you, if they are a toddler then stand behind them. Clean all tooth surfaces, remember the cheek side, tongue side and biting side on the upper teeth and lower teeth. Brush in a circular motion. Your child will have 20 primary teeth and it’s important to ensure they are clean each day. Encourage your child to spit out excess toothpaste but do not rinse with water as this will wash away the fluoride. Whilst fluoride is added to the drinking water in many places around the UK it’s still important to apply topically to prevent cavities. The quantity of fluoride in the toothpaste is designed specifically for the average body size. 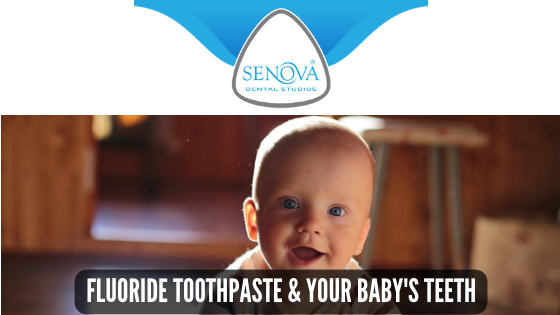 Because the child is much smaller than an adult the fluoride dose is much smaller in children’s toothpaste. This would mean that if you used children’s toothpaste as an adult you would not be having the correct amount of fluoride on your teeth which could lead you to be more susceptible to tooth decay. What is the cause of a baby’s tooth decay before two years? The primary cause of any tooth decay, leaving out any congenital disorders, is poor oral hygiene. in the year to 2018 26,111 children aged between 5 & 9 were admitted to hospital as a result of tooth decay. In total 44,047 children under the age of 19 were admitted to hospital, that’s more than children admitted for acute tonsillitis, viral infections, asthma, abdominal and pelvic pain! Children not cleaning their teeth at least twice per day. Consumption of too much sugar with out adequate cleaning afterwards. Drinking sugary drinks from bottles with teats. In summary, it is that adults responsibility to ensure that children keep their sugar consumption in check whilst ensuring that their children clean their teeth adequately each day.